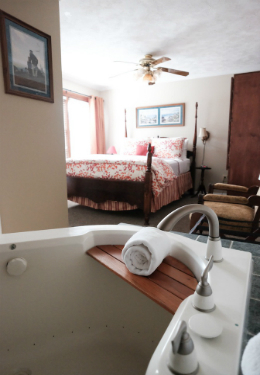 For the ultimate relaxation, this suite features a two-person whirlpool tub and a luxurious separate shower (feel free to BYOB “bring your own bubbles,” bath salts are not recommended and candles are prohibited). You can also relax in a quality queen-size bed and enjoy an upgraded 32 inch Smart TV, with Roku and Direct TV, while lounging in a fluffy bathrobe. 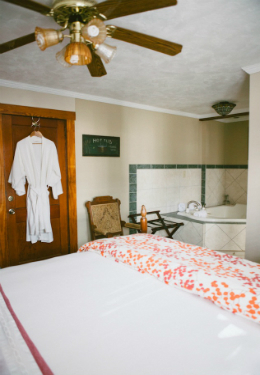 Located on the first floor of the inn midway through the house and only a few steps from the front porch, this room is popular for honeymoons and romantic getaways among guests celebrating a wedding, an anniversary, or a couple looking to enhance a special beach vacation. The room is cooled and heated by central air and heat and is approximately 19’X12’ in size. Don’t forget to add a Romance Package when making a reservation and check out our areas activities or attractions as well.